We’ve reached the stage of the season when a lot of injuries are probably not going to be healed by the time the playoffs start, a time when the team athletic trainers and the doctors are running out of time to fully treat their patients. In a lot of cases for contenders, open questions will linger about whether star players can actually be productive when they come back. He is in Arizona working out and taking live batting practice daily. He seems to be healthy, as he recovers from an ankle sprain, but he needs to get comfortable at the plate. Kemp had about 15 at-bats in a simulated game on Thursday. 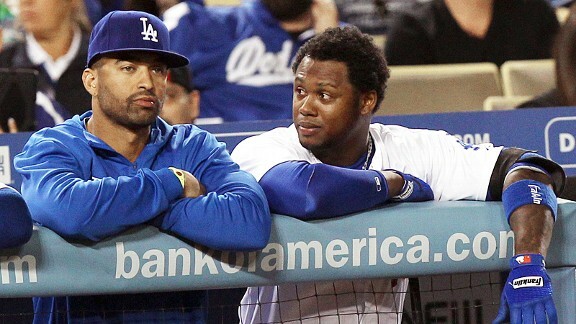 There will be a day soon when Kemp will return to the Dodgers’ lineup, and because they have a big lead in the NL West, manager Don Mattingly will have an opportunity to play him regularly to see how much Kemp can help -- to see what they see. Then, as the playoffs begin, Mattingly will have that information as he chooses which of his four established outfielders (Kemp, Andre Ethier, Carl Crawford and Yasiel Puig) he will sit. My own opinion: I don’t think the Dodgers have any real expectation that Kemp will represent an upgrade -- in 62 games this season, he hit .263 with five homers in 251 plate appearances -- and if he demonstrates in the final weeks that he can be better than one of the three other guys, well, then they’ll be pleasantly surprised. I do hope Kemp makes it back in time but yes, I've got low expectations as well. Partially because I want Kemp to shatter them and revert to MVP form. This seems to be before the hammy started barking.